As Mikhail Gorbachev became the Communist Party's General Secretary and the de facto leader of the Soviet Union in 1985, he became aware of much that we would learn for sure only later. He saw the way in which the unbridled growth of the defense industry during the cold war had polluted the country. He realized that life expectancy had been in decline since 1964. And the 1986 disaster at the Chernobyl nuclear power station vividly demonstrated to him the dangers both of bureaucratic bodies getting carried away with their grandiose designs, and of keeping everything hidden behind a veil of secrecy. In addition, the collapse of Soviet agriculture showed him the uselessness of using chemicals extensively on farms. All of this seems to have made Gorbachev exceptionally sensitive to voices that spelled out the risks of using pesticides; the dangers of reversing the flow of Russian rivers; the perils that a continuing arms race would present to the health of the people and the country's ecology. As Gorbachev realized that the fall of the Soviet system was imminent, he strove  and succeeded  to ensure that there was a peaceful, nonviolent transition of the closed and totalitarian Soviet society to democracy and openness. This is Gorbachev's historical achievement. Once he embarked on that quest, greater ecological awareness of how the state was managed inevitably followed. Along with it came a new openness with regard to ecological data, together with popular participation in decision-making that affected the environment. 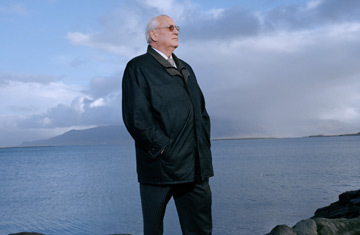 Once the U.S.S.R. collapsed, Gorbachev used his authority and experience to launch Green Cross International in the wake of the 1992 U.N. Rio Conference on Environment and Development. The Green Cross has emerged as a worldwide environmental-protection body that addresses everything from climate change to chemical contamination. "We are facing a global environmental crisis, a conflict between man and nature," Gorbachev told an Australian newspaper last year. "And that means we need a dramatic change in politics, in attitudes." If the world had more such leaders, we would be far better equipped to handle such challenges as global warming, the decline in ocean species and biological diversity, and all the other global ecological issues of our time.